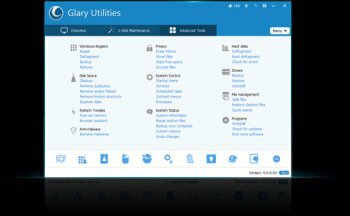 Glary Utilities offers numerous powerful and easy-to-use system tools and utilities to fix, speed up, maintain and protect your PC. It allows you to clean common system junk files, as well as invalid registry entries and Internet traces. You can manage and delete browser add-ons, analyze disk space usage and find duplicate files. You can also view and manage installed shell extensions, encrypt your files from unauthorized access and use, split large files into smaller manageable files and then rejoin them. Furthermore, it includes the options to optimize memory, find, fix, or remove broken Windows shortcuts, manage the programs that start at Windows startup and uninstall software. Other features include secure file deletion, an Empty Folder finder and more. You can really do without these programs these days, 15+ years ago they had their place but most of the utilities are either replicated accessible Windows functions or unnecessary & potentially damaging such as 'registry cleaning' - I fix heaps of units buggered up by such so called cleaning - Microsoft have never advocated registry cleaning. Note: I installed this program some years ago & my wife got pregnant, so beware! I made this App portable to Test the Internal Apps as Stand-alones. This is aimed MAINLY at Peeps with Little knowledge about Systems. I didn't Install, So no Reg keys were Generated... HOWEVER..!! I have a system Monitor, which wouldn't Shut TF up. That told me Something was Active In my System Without Launching Anything. Unpacking This App was the Trigger (without getting techy). I launched "ONE" app, & a key was generated in the HKCU (2) folder. That key Will Still be there. & every Boot will Activate it. - Check their Registry At the 2 locations I listed Above. - Check Your "Running" Services. - Call-up msconfig & check all is OK there..?? I have tried all kinds of all in one utility programs like mcafee, symantec's 360 and let me tell you that both of these programs don't offer what Glary Utilities has to offer. Glary Utilities is faster more reliable then then both of them. Norton 360 is terrible and should be stopped from being developed. Mcafee software used to great top of the line but recently It is just like norton 360 terrible. 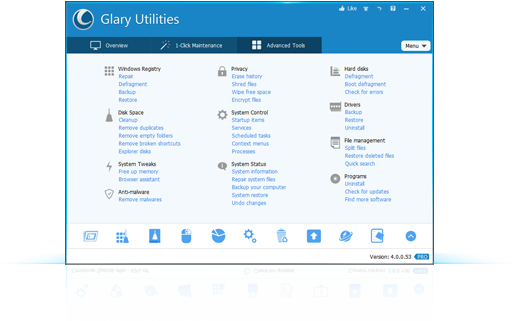 Glary Utilities are so much better simply because the utilities are simple to use. CCleaner is good but I tried that program as well found It to be even worse then everyone else It kept lagging down my system making It run too slow Glary Utilities doesn't do that. As with the rest of the multi-clean & optimise programs about lots of the utilities on offer are available in Windows or by enabling GOD made, the defragger is very good & extremely fast with a full boot defrag, but the cleaners are no better than CCleaner with winapp2 enabled & not as thorough. The registry cleaner found a worrying amount of so called bad entries & it wasn't easy to verify whether they were OK or not, my experience with Windows leaves me highly suspicious of the value of registry cleaning as I've seen to many broken PC's & if in doubt leave well alone. New beta is step backward from simple and easy to look application it is now. I guess they are trying to be edgy like others. Limited cleaning facilities, some of the tools on offer could mess up your system. You really don't need this all-in-one or any so called utility system & there are lots around. 90% of the tools on offer are available in other parts of Windows esp. if you enable 'GOD mode'. if you want to clean your system use CCleaner & Wise Disc Cleaner both free & without bloat & unneeded vapour-ware add-ons. OK as long as you use the free version as CCleaner & XCleaner do a better job of basic cleaning. Some functions of Glary such as the duplicate file finder & the uninstaller (that show things usually hidden & for good reason) you really could mess things up if you aren't careful - So use with caution, that's good advice with all such software. One word of gratitude to @Input Overload and to @Uriel : made my laugh of the day, not ironical but truly that of a wide wide smile :) Gorgeous ! Slows any pc by a lot! Pretty good but could be better. Don't mind Imput Overload. He's somewhat retarded. A change-log would be good. Otherwise the program is improving esp. The registry cleaner, it's far less likely to come up with FP's. A good program for the none tech minded. I would rate it as pretty safe now after several runs of the software on several PC's. Still good, even on a state of the art PC the registry clean takes ages & take care as it cannot be totally trusted, check before you delete. It’s not really worth buying, use the free version, as there is not much difference. Still good, never caused me any issues.